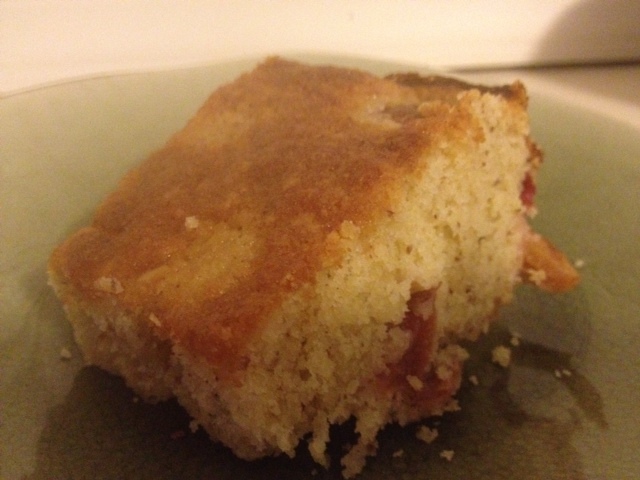 Cherry Almond Cake | Om nom nom! Rinse, dry, and pit all the cherries. Then take about 14 cherries (about 1/3), cut them in half, and set them aside – they’re for topping the cake later. To the rest of the cherries, cut into quarters. In a separate bowl whisk together the flour, ground almonds, baking powder, and salt. Beat the eggs and sugar until thick and light colored (about 3-5 minutes). Beat in the vanilla extract and almond extract (if using). Then fold in, with a rubber spatula or wire whisk, the melted and cooled butter and milk just until incorporated. Next, fold in the flour mixture just until moistened. Gently fold in the quartered cherries (not the cherries that you have halved for the top of the cake). Pour the batter into the prepared pan, smoothing the top with an offset spatula or back of a spoon. Bake for 15 minutes then remove from oven. Quickly arrange the remaining cherries, cut side down, on the top of the cake. Return the cake to the oven and bake for a further 15-20 minutes or until golden brown and a toothpick inserted into the cake portion comes out clean. If you find the cake over browning, cover with a piece of aluminum foil.